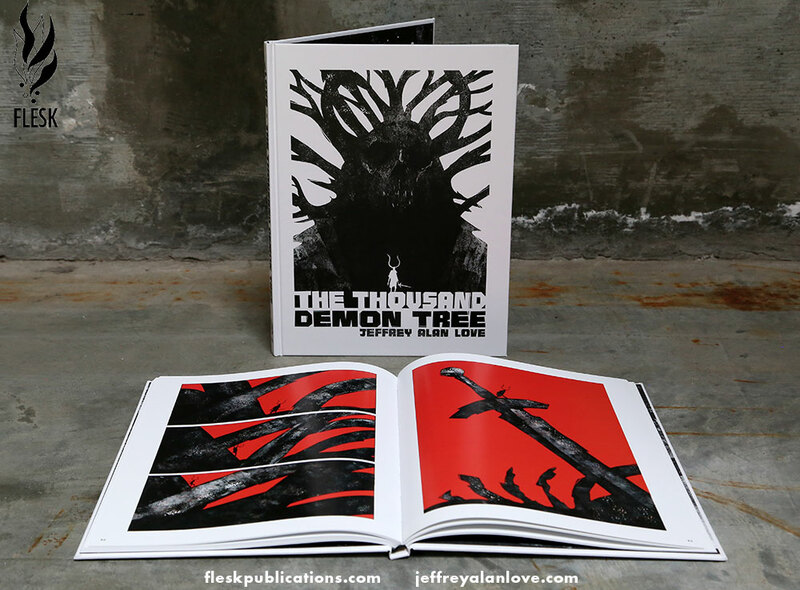 The Thousand Demon Tree by Jeffrey Alan Love. New Book from Flesk! 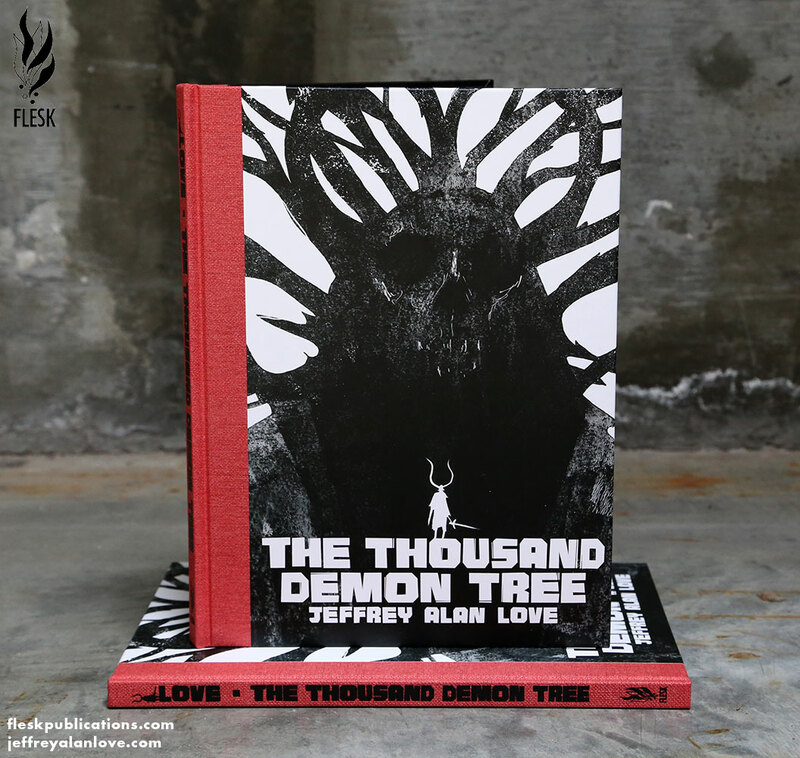 The Thousand Demon Tree by Jeffrey Alan Love is now available! I’m especially proud to have the opportunity to publish Jeff’s second book. Jeff is doing things with art and story that no one else is doing. I feel he is one of those true original creators—someone who can share a narrative in a way unseen before. What is striking about his story is how well it is told without the use of words. The Thousand Demon Tree is strong and bold with a lesson in design that any student can learn from. Jeff and I have a simple method of working with one another. I leave him alone to do his art and story. He leaves me alone to package the book and handle the marketing and promotion, while getting the book out there into the world. At the same time we communicate often to keep each other updated and to offer our support to one another. Our process comes from a mutual trust in our respective abilities along with an admiration for what our respective strengths are. It’s easy. It’s the same while working with Mark Schultz, Gary Gianni, J.A.W. Cooper and the others who I have a long-term relationship with. I like easy. I like a natural flow of going back and forth without any issues or miscommunications distracting us from the work. I appreciate working with Jeff. Are we already planning another project together? Yes. I’ll announce it in the spring or summer of 2019. Thanks again everyone. Both Jeff and I are grateful to you all for supporting his books. Here’s the link to learn more about the book and to order. Look what arrived today! 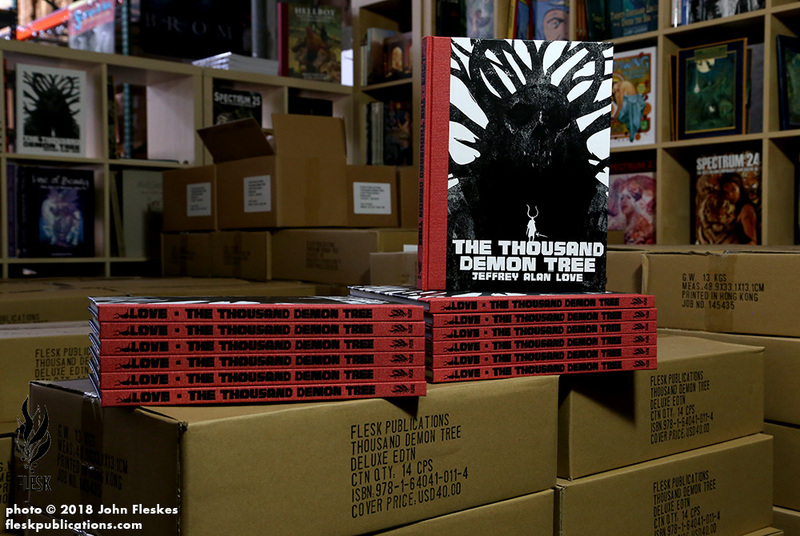 Our printer sample copies of The Thousand Demon Tree by Jeffrey Alan Love. The version with the red spine is the signed edition that is already sold out. 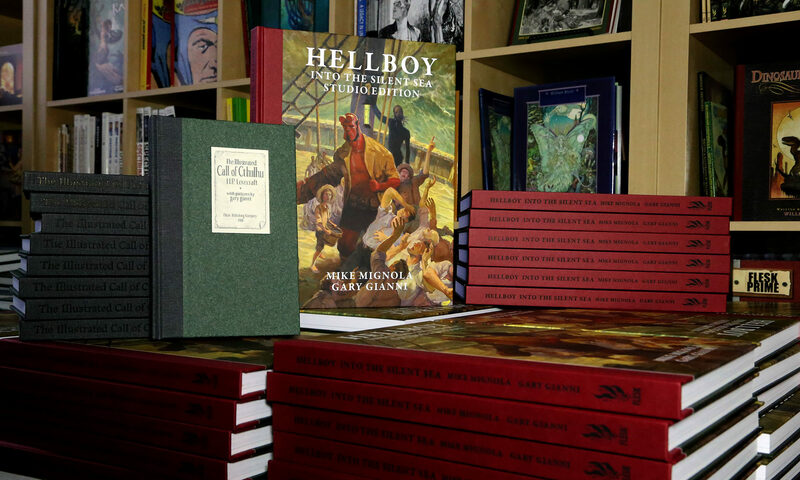 The regular hardcover edition can be pre-ordered on our Flesk website. The books are slated to arrive at our Flesk warehouse on August 25th. We’ll start shipping the Kickstarter pledges and pre-orders at that time.